Every fall I look forward to the opportunity to speak to Council and the public regarding their vision for Ottawa’s future and to listen to where residents would like Council to focus our resources. Over the last few months, Council has worked with the City Treasurer and the City Manager to deliver a budget that keeps us on a balanced path of fiscal responsibility. I am pleased to report that we are bringing forward a budget for 2018 that focuses on securing a sustainable financial framework for the coming years. A budget that is balanced, affordable and progressive. For the fifth year in a row, the proposed increase in the City of Ottawa property taxes is at two per cent. This means that for the average urban household, valued at $404,000, the tax change will be $74. For the average rural household, the tax change will be $60. Property taxation is the single most important tool our City has to maintain affordability for our residents, and I am proud that Council is delivering on this key commitment. It is important to listen to residents through the budget consultation process – and we have built residents’ feedback into the draft 2018 Budget being tabled today. Over the last few months, there have been five multi-ward, Councillor-led consultations, as well as four single-ward consultations. The City has received budget ideas and feedback from residents, community groups and stakeholders through a variety of ways. 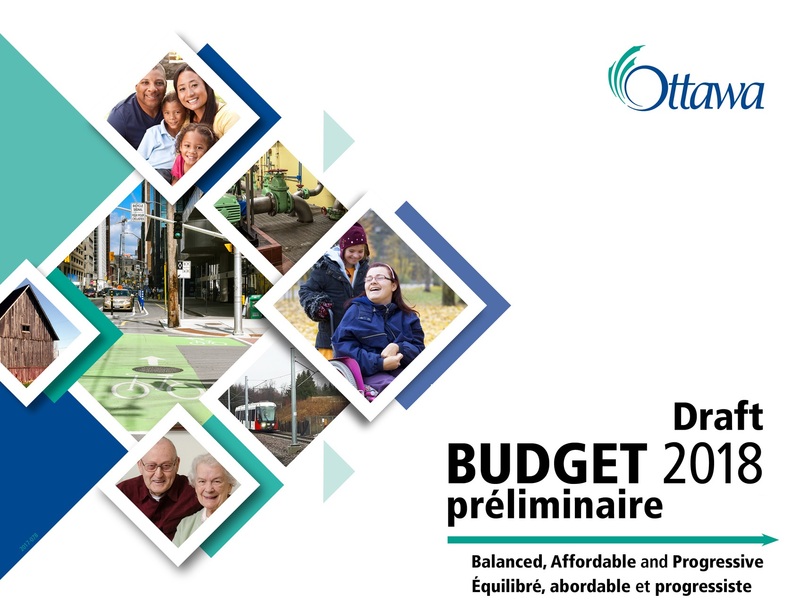 This includes the Councillor-led Budget consultations, the Budget planning tool proposed by Councillor Tim Tierney available on ottawa.ca, and the City’s social media channels. As of November 1, there were over one thousand visits to the budget planning tool. My office, the City Treasurer and the City Manager’s office have met with every Member of Council and Committee Chairs to hear their budget priorities. I have also hosted a series of community breakfasts to hear priorities directly from community leaders and residents. It is not always the case, but this year, what we have heard has been clear and consistent. Residents understand that the last seven years have seen us focus more heavily on transit infrastructure – which required a massive catch-up effort. Today, residents are asking us to shift some of that focus to our social infrastructure and to our other built infrastructure needs. What we are hearing – at public meetings or in informal conversations – is the need to continue to do more about the state of our roads, infrastructure, buildings and parks. And that the winter maintenance of critical infrastructure, like our roads and sidewalks, must continue to improve. The changing weather patterns have created major challenges in maintaining our roads, pathways and community infrastructure. The abundance of rain and spring flooding, the extraordinary amount of snow, and the number of freeze-thaw cycles has significantly impacted the quality of our roadways, shoulders, sidewalks and road beds. Investing in existing infrastructure is not always the most popular budget approach for Council to take – as politicians we always want to announce something new. But I have heard from almost every Member of Council that our roads, facilities and sidewalks need more attention now. The infrastructure gap is a significant challenge for municipalities nation-wide. In response to these concerns, our total budget contribution for roads, bike lanes, sidewalks and facilities will increase by $12.6 million dollars in 2018, to bring us to $112.4 million in annual funding. That’s an increase of 13 per cent. Thanks to this increased commitment, we will invest an additional $100 million over the next 8 years for capital works. Let me give you a sense of how these additional dollars will be invested. First, as I mentioned, we will be responding to the number one request from residents – to put more funding into road resurfacing and renewal. In 2018, the road resurfacing budget will be increased by $5.6 million, for a total budget of $39.2 million dollars – that’s a 17 per cent increase over 2017. Secondly, our rural infrastructure investments will reach $42.2 million in 2018, up from the three-year average of $36.8 million dollars. This funding includes rural roads and culverts repairs. Budget 2018 will allow the City to repair or resurface over 70 kilometres of roads in the rural area. Councillor Moffatt will see sections of Rideau Valley South and Fallowfield Road resurfaced while Councillor Darouze will see sections of Stage Coach Road and Van Rens Street repaved. In addition, the City will be investing $24.3 million dollars towards bridge rehabilitation in 2018. This is an increase from just under $14 million last year. This includes projects such as the Fitzroy Harbour Bridge and the Anderson Road Bridge. We must also continue to improve our ability to repair potholes. Since January 2017, City staff have filled over 253,000 potholes across Ottawa. Even with this level of activity, we have heard consistently that we need to do more. That is why 2018 budget will make permanent the $400,000 one-time increase in the pothole and minor asphalt repair program introduced in 2017. We will add $200,000 in one-time funds to bring the program to $8 million – an 8 per cent increase over 2016. This funding will help us deal more effectively with the immediate patching and pothole needs caused by the significant weather fluctuations and increased construction level that have impacted Ottawa. We also need to look at innovative ways to improve the condition of our roads. That is why I have asked staff to investigate the possibility of running our own asphalt plant in order to ensure quality and price, and to investigate new technologies that may improve the long-term durability of our roadways. Ottawa spans more than 90 km from east to west and has one of the largest municipal transportation networks in Canada. Maintaining our network is expensive. That is why Budget 2018 includes an increase of $2.3 million to the base budget for winter maintenance – bringing the total annual funding to $68.3 million. This is in addition to the $4.5-million base budget increase for winter maintenance introduced last year, for a total increase of $11.3 million dollars over the last three years. This new base funding meets the level of funding recommended by the independent KPMG audit. The winter cycling network will also be expanded, adding O’Connor and Main Street cycling lanes. Signs of increased prosperity are all around us as public and private sector investment is booming. The Conference Board of Canada has forecast that Ottawa-Gatineau’s real GDP growth will be 2.2 per cent in 2018 following a forecasted 2.5 per cent increase in 2017. This is the strongest back-to-back increase since 2007 – 2008. But that prosperity is not shared equally by all our residents. We need to continue to do more for our most vulnerable residents who rely on our city’s strong network of community-based social services. I now want to focus on how we will provide much needed support to the fast growing social infrastructure needs of our city. Residents want us to find a way to ensure that both the city and our community partners are ready to respond to the challenges of increasing costs and legislative changes from other levels of government. We have heard from community arts, recreation, social and housing service providers who are concerned about budget pressures caused by provincial changes to the minimum wage. I am pleased to say that while Budget 2018 will meet the City’s own obligations to address the minimum wage increase, it will also include funding to support our partner agencies, to help them with their increased costs from minimum wage increases. We recognize that these service delivery agencies have few options to make up for these funding pressures. Without additional resources, they would have little choice but to reduce services while the needs of their clients are growing. This is NOT the right time for cuts to our social service agencies. For this reason, Budget 2018 will provide an inflationary increase of 3 per cent to our social services agencies. This translates into an additional $675,000 in 2018 for a total annual investment of $23.2 million. Social service agencies will also see a base budget increase again this year, which, when added to the inflationary increase, will provide a total increase of 4.4 per cent in 2018. This represents an annual increase of approximately $1 million for this sector. This community funding helps support 93 agencies that run hundreds of essential programs across the entire city. There will also be an additional 3 percent or $760,000 going to housing and homelessness agencies, for a total of $26.3 million. The City will also be increasing the amount provided for housing programs by $1.7 million to meet the housing sector’s other cost pressures. We will also be replacing $1.3 million of funding that lapses with the expiry of federal operating agreements, bringing the total City contribution to $81 million in 2018. This is up $3 million from our 2017 Budget of $78 million – a 3.8% increase. When combined with funding from upper levels of government, this is a historic investment in housing and homelessness in Ottawa. With the rate of inflation currently sitting at 1.5 per cent, this is a significant increase to the base operating dollars of these important service delivery agencies. I would like to take a moment to tell you some of the other things we will be doing for housing and homelessness in 2018. Thankfully, we do not face the housing and homelessness challenge alone. The role of the federal and provincial governments in housing is especially important this year. The federal and provincial governments are currently in bilateral negotiations on the social and green infrastructure funds. We are also expecting the release of the long-awaited National Housing Strategy and the Federal Anti-Poverty Strategy, within a few weeks. These anticipated announcements will be followed by detailed contribution agreements, funding conditions and provincial and national priorities and benchmarks. But from what we know today, given the increased support from the Province of Ontario and the Government of Canada, the planned capital investment in social housing – including retrofits and construction of new units – will increase from $20.6 million dollars in 2017 to $52.6 million dollars in 2018. As a result, the number of new units funded will increase from 137 in 2017 to 300 units in 2018. It is impossible to understand the City’s housing funding without drawing the whole picture of how the three levels of government are working together towards the same important goals. For the most part, these common goals reinforce and support the City’s commitment to our Ten-Year Housing and Homelessness Plan. The City and its community partners will only be able to achieve these local goals if we continue to work together with our federal and provincial partners towards shared outcomes. In Innes, Councillor Mitic’s Ward, we built 1900 St-Joseph Blvd in partnership with Montfort Renaissance, a 48-unit supportive housing program for individuals experiencing chronic homelessness. In 2018, the City will be investing more towards housing and homelessness, as are the federal and provincial governments. But there is more news and progress to come: the City will be ready to leverage upcoming federal and provincial funding opportunities so that we can best meet the needs of our community. The City will also see an increase in provincial funding in 2018 through the Community Homelessness Prevention Initiative, for a total of $37.6 million. This funding supports a number of housing and homelessness initiatives for low and moderate income residents at risk of or experiencing homelessness, by providing them with the necessary supports to find and keep their housing. The City also received $47 million over four years through the new provincial Social Housing Apartment Improvement Program for repairs and retrofits. This funding will improve living conditions, reduce costs through energy conservation, and fight climate change thanks to improvements that reduce greenhouse gas emissions. The City will also benefit from an additional $4.7 million from the federal and provincial governments to develop new affordable and supportive housing that results in a total investment of $72.2 million from 2014 to 2020. The City will also receive $7 million from the Federal Homelessness Partnering Strategy in 2018. Over the last few years, this program has helped 516 people experiencing long shelter stays, move from emergency shelters into permanent housing with supports. The City will also receive $30 million for local capital and operating funding through the recently announced Provincial Home for Good Program. This new funding will expand the City’s Housing First Program, provide supports for people living in transitional or supportive housing programs, and will allow for peer support workers as well. These additional operating dollars will increase the number of rent supplements and housing allowances available. This will also provide funding for first and last month’s rent and unit set-up. Both of these can be significant barriers for low income residents seeking shelter. Overall, the operational component of this funding will support approximately 310 households to find and keep suitable affordable and supportive housing in Ottawa. The capital component of the Home for Good Program will support the construction, renovation or purchase of approximately 150 new supportive housing units in Ottawa. This funding is complemented by the Child Care modernization and social assistance reform. For example, the City is receiving additional funding through the Provincial Child Care Expansion Plan and the Federal Canada-Ontario Early Learning and Child Care Plan. In 2017, the City received $13.6 million more than was anticipated to support access to licensed child care. This funding will help over 1,400 local children access affordable child care and will significantly reduce – and possibly eliminate – the current child care subsidy waitlist for children ages 0 to 6. It is estimated that the City will receive an additional $7.3 million in 2018 as part of this commitment. Additionally, the Province announced its intention to transform provincially-funded child and family programs into an integrated, cohesive system of services and supports for children ages 0 to 6 and their parents and caregivers. These services include free programs such as playgroups, where parents can attend with their child and have access to information and supports. In total, the 2018 provincial funding allocation for Ottawa is $8.4 million for Early Years and Family Centres plus the $7.3 million under the child care expansion programs. I believe that by working with stakeholders, this additional funding will allow us to continue to transform Child Care and Early Years services in Ottawa. I want to thank Councillor Mark Taylor, our special liaison for housing and homelessness, Councillor Michael Qaqish, our special liaison for refugees, Councillor Diane Deans, Chair of the Community and Protective Services Committee, and Jan Harder, Chair of Planning, for their strong advocacy for these additional funds and for their continued diligence to implement these new programs moving forward. Budget 2018 will provide a 3 per cent increase to our parks and recreation services agencies. This represents an injection of $ 50,000 to their base budgets. We will also be providing an inflationary increase of 3 per cent to the Outdoor Rink program to meet the impact of minimum wage increases. This will bring the funding for this program to $825,000 in 2018. Affordable child care, housing and transit go hand in hand. Towards this end, Members of Council and the Transit Commission listened to the calls for the City to find ways to support residents who face economic challenges through a more affordable and equitable transit fare. The 2017 Budget introduced the EquiPass, a transit pass for low-income residents. To date, the EquiPass has been purchased by about 2,600 eligible transit customers per month, based on the last three months. Thanks to the leadership of Commission Chair Stephen Blais, there is funding in the 2018 Budget to introduce a Single-ride equitable Fare. Eligible EquiFare transit customers will get the same deep 50% discount as EquiPass customers. This means that a new single ride EquiFare will cost $1.75, compared to the 2018 single fare of $3.45. OC Transpo is aiming to make the new EquiFare available before the end of June 2018. Together, EquiFare and EquiPass represent the single largest one-time increase in the City’s history to support the needs of transit users living below the low-income cut-off. In 2018, the total EquiFare and EquiPass subsidy increases to $3.7 million dollars from $2.7 million dollars. The City has also made major investments in improving Para Transpo service in recent years, including the modernization of the minibus fleet. In 2018, staff will be reviewing Para Transpo’s service eligibility criteria to bring it in line with industry best practices. This will expand eligibility for Para Transpo to include persons with developmental or mental health disabilities. As you may remember, Uber has agreed to pay a voluntary seven-cent per-trip surcharge for all completed trips, which commenced in October 2016 when Uber became licensed. I have asked staff to work with the City’s Accessibility Unit, and the Accessibility Advisory Committee, and to report back to Committee and Council in the new year with a recommended spending plan for this approximately $450,000 in annual funding. We have heard from our rural and suburban Councillors that some residents are finding it hard to commute to work or school because their peak-hour buses are full. Budget 2018 does a number of things to expand service to growing communities. In collaboration with the Government of Canada, we will be introducing 17 new double-decker buses to meet the growing demand, at a cost of $18.4 million dollars. Twenty new routes will start this December, which will lay the foundation for future growth in ridership for the Confederation Line and Stage 2 LRT. Kanata, Stittsville, Barrhaven, Riverside South, Ottawa South, Orléans, the new development at Wateridge/Village Riverain, are some of the areas that will see new or improved transit service. As a result of this funding and the addition of 17 new buses to OC Transpo’s fleet, various routes will see increases in frequency. Some will be extended, capacity will be increased on others, and new connexion routes will be introduced to provide faster travel times for customers. Budget 2018 also maintains free Wednesday transit service for seniors. Budget 2018 will also see an increase in funding for the Community Support Service agencies who provide transportation in the rural areas, for a total base budget of $605,000 – an increase of $100,000. This program – designed to improve access to transportation services for rural seniors and disabled residents – provides approximately 15,000 trips annually to residents. Thanks to our rural Councillors Steve Blais, Eli El-Chantiry, George Darouze and Scott Moffatt for advocating for this improvement. Because of Council’s steadfast commitment to the Confederation Line and Stage 2 LRT, the City, the province and federal government are investing with confidence in the future of transit in Ottawa. As a result of the funding from all three levels of government, Budget 2018 includes more funding to build the largest single environmental project in the City’s history – Stage 2 of LRT. The forecasted capital spending on Stage 1 LRT in 2018 is about $550 million – for a total investment of $2.1 billion. For every $1 billion dollar invested in new infrastructure, 10,000 person years of employment will be generated in Ottawa, including 5,500 new jobs in the construction sector. This high level of capital investment will encourage growth, protect jobs, and improve household and business confidence. I also want to thank west end Councillors – including Councillors Taylor, Wilkinson, Hubley, Qadri and El-Chantiry, and Chairs Blais and Egli. Their strong advocacy efforts led to an investment of 3 million dollars to fund the Bayshore to Kanata LRT Environmental Assessment, which will be completed in 2019. By working together, we have accomplished more in seven short years of LRT planning and construction than we ever dreamed possible. In 2018, we will see more and more evidence of this dramatic transformation in how Ottawa residents commute and travel within our vast city. But we are not done yet – because we still have work to do to reduce the bottleneck of buses traveling inefficiently between Ottawa and Gatineau. In early 2018, we will convene our first meeting of the Joint Working Group on Transportation with the City of Gatineau. I look forward to working with my colleagues – Chairs Egli and Blais – to explore opportunities for better regional integration of transit services and large transportation projects. There will also be funding for the refurbishment of the Rosemount Library in Councillor Leiper’s ward, and for the purchase of land and design work for a brand new community centre and library in Riverside South, in Councillor Qaqish’s ward. Under the leadership of Tim Tierney, Chair of the Ottawa Public Library, Budget 2018 also includes funding to continue the planning and design work underway to deliver our new Central Library. Positive discussions are ongoing with the federal government on a potential combined Central Library and Archives Project that could soon become an important landmark along our new LRT network. We also heard from residents that access to quality recreational facilities is an important priority for 2018. We will be investing more in city recreation and cultural facilities, with an additional $700,000, for a total renewal investment of $16.1 Million in 2018. This covers upgrades to our buildings, swimming pools, splash pads, fitness spaces and outdoor courts. We will also be adding $250,000 to the park renewal budget, for a total investment of $5.25 million in 2018. This funding will lead to improved play structures and equipment and improved park pathway lighting. There will also be an additional $2.5 million to improve the accessibility of our parks and playgrounds for all users. Councillor Mitic, who is also our Sports Commissioner, has been working hard to have the Blackburn Arena redeveloped and made accessible. Budget 2018 includes $1 million dollars for this project and we are working with MP Andrew Leslie and MPP Marie-France Lalonde to secure matching funds from their two levels of government. The funding for park renewal is on top of the $7 million for park projects already funded from development charges. This funding will see new park development in growth areas such as Riverside-South District Park, and in Gloucester-Southgate, Diamond Jubilee Park (in ward 22) and Hillside Vista Park (in Ward 1). We have also identified funding for the City’s own recreational programs to mitigate the impact of minimum wages. Without this additional funding, recreation and admissions fees in the City would have increased by 6 per cent. With this funding, we will be able to hold the City’s recreation fee increases to 2 per cent for 2018. This is after we managed to freeze recreation fees for three years in the last term of Council. This increase represents 25 cents on the average swim or public skate admission fee. To mitigate the impact of these increases, the Recreation Fee Subsidy Program will also increase to $1.1 million in 2018 – an increase of $35,000. This program helps ensure that low income residents can benefit from the City’s recreational programs. I am pleased to report that Budget 2018 also heralds some very significant investments in core municipal services that matter most to residents. We will hear from our Chair of Ottawa Police Services, Councillor El-Chantiry, that Ottawa Police Services is adding 25 new officers in 2018. We will also see an increase of 14 new paramedics in 2018. My thanks for the strong advocacy of Councillors Darouze and El-Chantiry on this important new investment. We are working to help ensure that these investments in paramedics will lead to improved response times – particularly in our rural and suburban wards. There will also be an additional 10 new crossing guards to service areas in need, as identified by the local School Boards. This brings the total number of crossing guards in Ottawa to 209 by the fall of 2018. We have been proud to partner with our local festivals and arts organizations to make 2017 a year to remember for our residents and millions of visitors. There is no doubt that 2017 will have been a tremendous year for our local artists and arts organizations. In just a few weeks, we will witness the opening of the new Ottawa Art Gallery, which is approximately three times the size of the existing space. In 2018, we will open the redeveloped Arts Court facility, along with the new Black Box Theatre, developed in partnership with the University of Ottawa. Budget 2018 includes $2.1 million base dollars to staff and operate the newly expanded Arts Court Facility and Ottawa Art Gallery. The OAG Expansion and Arts Court Redevelopment project represents a public-private investment of over $100 million, and it will quickly become a new regional cultural destination. The public sector component, valued at $43.4million is funded by the City of Ottawa, the Government of Canada, the Province of Ontario, and other partners including the Ottawa Art Gallery (OAG) and the University of Ottawa. The City is contributing $17.7 million, the Province of Ontario has provided $7.3 million in funding, the government of Canada has provided $5.3 million through the Canada Cultural Spaces Program. I want to thank Councillor Cloutier for chairing last year’s Tourism Summit and for bringing forward several suggestions to ensure that we build on the success of 2017. We chose to invest smartly to maintain the momentum of our local arts and cultural organizations into 2018 and beyond. That is why I announced $150,000 in base funding to launch the Arts Momentum Fund, aimed at ensuring that we continue to showcase all that Ottawa has to offer. After much work and extensive consultation, the arts and heritage community leaders have come together. Their recommendation is to use this funding to produce a strategy that will shape the future of the cultural sector for years to come. Because of the long-term nature of this goal, I am proposing the same base investment of $150,000 in 2018 towards the Arts Momentum Fund. This increases the base funding to $300,000 in 2018. I look forward to hearing the recommendations of this coalition of arts leaders in 2018 as they chart a new future for Ottawa’s arts and heritage sector. Cultural agencies funded by the City will also receive a 3 per cent inflationary increase, in recognition of the minimum wage pressures in this sector. In 2018, the total annual budget for cultural agencies will be $11.3 million, a base increase of $330,000. Budget 2018 also continues funding of almost $5 million that has been approved for the Renewed Arts, Heritage and Cultural plan since its inception in 2013. These funds include a diverse range of cultural supports, including marketing and promotion of the local cultural scene, the Poet Laureate Program, as well as neighbourhood cultural initiatives, to name just a few. In this Term of Council, the arts and culture community has secured municipal investments totalling more than $20.8 million in capital, one-time and base operating dollars. This level of investment sets the stage for success for the community-led strategy leading into the next Term of Council. Thanks to Councillor Leiper’s leadership, the City has been working with our music industry partners to develop a strategy to strengthen this growing sector of our local economy. The group will be delivering its report to Council in early 2018. I am pleased to report that we have set aside $100,000 for the Ottawa Music Industry Coalition – to deliver on priorities that will be identified in the Music Strategy. One of the key tools Council has to support neighbourhoods in need of investment is Community Improvement Plans. I want to commend Councillor Chiarelli for supporting the Bells Corners CIP, which has delivered about $20 million in new investments to date. The Orleans CIP, championed by Councillor Monette, is also producing some exciting new businesses and jobs in the East End. I am pleased to report that I have been working with Councillor Fleury to ensure that Montreal Road will be the next area to benefit from a Community Improvement Plan. Funding in the 2018 Budget will enable us to consult with businesses and property owners to identify what measures would spur investment and bring more businesses to this area. Through the leadership of the Chair of the Environment and Climate Protection Committee, David Chernushenko, we have heard the calls to strengthen our investments in environmental sustainability, climate resiliency and energy conservation. I am pleased to report that the construction of our world-class LRT system will result in the single largest reduction of air-borne pollutants in our City’s history. Stage 1 LRT will reduce greenhouse gases (GHGs) by 94 thousand tonnes by 2031. Stage 2 will increase that to over 200 thousand tonnes annually by 2048. This will have a direct and positive impact on the sustainability of urban growth in Ottawa. And it will lead to improved health outcomes for residents. As part of Budget 2018, under the umbrella of the Energy Evolution initiative, the City will be investing more than $2 million in various sustainability initiatives. This includes energy conservation, greening our fleet and protecting our environment. All of these initiatives will now fall under the mandate of the Environment and Climate Protection Committee. Taken together with our investments in public transit, cycling, active mobility and LRT, the City is doing more than ever to improve Ottawa’s environmental sustainability. To date, more than 80 community partners such as the City, Hydro Ottawa, Enbridge, Ecology Ottawa, the Museum of Science and Technology and the Ottawa Chamber of Commerce have worked together to develop green innovation in Ottawa. Later this month, the Environment and Climate Protection Committee will be reviewing the details of the next steps for 2018. Energy Evolution also includes $500,000 for Green Fleet initiatives, such as anti-idling, biofuels and hybrid vehicles and $500,000 for new community-based initiatives. Under the umbrella of our Energy Evolution leadership, the City’s Building Engineering and Energy Management Team (BEEM Team), has introduced over 120 energy reduction initiatives since it’s inception. In 2018, the BEEM group will receive $1 million towards new projects. With the conversion of 58,000 streetlights to LED technology, the City is in the process of saving $6 million annually. These investments are making tangible changes on the ground. The Hintonburg Community Centre, which has had numerous mechanical, control, and lighting upgrades, has reduced electrical use by 38 per cent and gas use by 58 per cent, for an annual savings of $29,000. The City has provided Electric Circuit with access to its premises to install six charging stations in Ottawa, including at the Terry Fox and at the Fallowfield Park and Ride facilities in Councillor Wilkinson and Harder’s wards. In 2018, twelve new electric vehicle charging stations will be installed at City facilities. The City of Ottawa is rich in natural areas – this green space and parkland serves as a draw for residents and visitors. In 2018, the City will acquire and protect community greenspace valued at $340,000 in the rural areas and $170,000 in the urban area. We recently used $1.5 million from the Environmental Resource Area Acquisition Fund to help acquire and protect important community greenspace like Shea Road Woods in Councillor Qadri’s ward. In 2018, we will see 125,000 trees planted across the city to increase forest cover in urban, suburban and rural areas. Last week, Ottawa successfully issued the first Municipal Green Debenture in Canada – which raised $102 million dollars. The City’s Green Debenture Framework is intended to finance environmentally friendly projects across the City that will help us mitigate or adapt to the effects of climate change such as our Light Rail Transit. There was strong demand for this new offering which allowed the City to reduce the price of the debenture – saving $400,000 in interest costs over the life of the bond. The debenture by-law report will be considered later today at Council. I am very proud of the balance we have achieved today. I am also very proud that our strong collaboration with the Province of Ontario and the Government of Canada is delivering jobs, strong growth and economic confidence for Ottawa residents. By working together, we have been able to align mandates to leverage outcomes for residents and to invest in the social and physical infrastructure of our city. I want to thank our City Manager, Steve Kanellakos, his office and the entire management team for their hard work and for the countless working meetings on Budget 2018. Budget 2018 challenged our very capable General Manager of Corporate Services and City Treasurer Marian Simulik, Deputy Treasurer Isabelle Jasmin, and Brian Flynn Manager of Financial Services, to find the funding for the priorities identified by residents from across the city. Thanks to the entire team in Corporate Services for delivering this budget proposal. strengthening our commitment to core services with the addition of police and paramedic first-line responders. I am very proud that this Council is keeping its commitment to Ottawa residents on property taxes. This is the cornerstone of our commitment to keeping Ottawa affordable for our residents. I am also proud that we are proposing a balanced, affordable and progressive path forward for 2018. I want to thank all Members of Council who contributed ideas to the 2018 Budget process, including many ideas from their residents. I also want to thank all the Chairs, Vice-Chairs and Committee members for their input to date, and for the work ahead to facilitate their respective budgets through their committees. I would like to close by thanking my own team in the Mayor’s Office for working closely with the City Manager and City Treasurer on Budget 2018, in particular Serge Arpin, Robyn Guest, James Armbruster, Mathieu Gravel, Danielle McGee, Livia Belcea and DG Stringer. Budgets have and will continue to be about setting priorities and being prepared for what is to come. It’s about being up front with residents, and it requires an honest accounting of where we are at – we simply cannot be all things to all people. This is a budget we can be proud of. I am looking forward to your input and the public’s input in the weeks ahead.